Mark Zuckerberg had a distinct advantage, which enabled him to take control of the recent congressional hearing in which he testified. The members of Congress who questioned him were out of touch with how the social media platform functions. They were not able to meet him where the friction/controversy of his technology is. Facebook has been, and still is, compromising its users’ privacy. Zuckerberg was able to dodge the hard questions because of the way the questions were framed. For example, he was asked, “Do you sell user data?” The answer seemed to be an obvious yes. But, in fact, Facebook does not directly sell users’ data. So Zuckerberg was able to dodge the questions saying, “We do not sell our data.” Other questions along this line were asked and also received a no. This was a missed opportunity. What should have been asked are questions like this: Do you have policies that protect your users’ privacy? Do require outside developers to meet strict terms and conditions regarding the handling of information they gather from Facebook users? Asking what were basically rhetorical questions instead allowed Zuckerberg make easy denials and take control. Were the committee members afraid to fully expose Facebook? Or were they really that out of touch with how the social media platform operates? It is important to understand the operation of Facebook. Most people only think about the direct user experience. But this is just one aspect of it. Facebook has two audiences, both equally important to the success of the company. I define direct users as everyday people who use the platform to engage in normal activities like posting, venting, seeking advice, debating issues, etc. The other audience is vendors and organizations that buy Facebook’s services to push their products to the users. I would argue that vendors and organizations are a little more important to Facebook than the regular users because that’s how Facebook makes its money—from advertisements. Not simply broad-based advertisements either, but very intricate and sophisticated targeted advertisements based on Facebook’s algorithms which identify user attributes—behaviors, interests, social interactions, etc. The more free data it receives from its users, the easier it is for Facebook to entice vendors and organizations to pay for their services, which connect to their 2 billion users. The problem with Facebook is not just with the company policies and processes. Nor is it limited to outside developers who create apps that enable vendors and organizations to use Facebook data to manipulate/influence user behaviors for their own interest. The problem is also with the users themselves. Every day, 2 billion Facebook users decide, deliberately or accidentally, to provide intimate information to the social network for free. And they apparently believe that what they receive in return justifies giving up who they are or pretend to be. Facebook then uses that data to stimulate and build our obsessions in order to keep us engaged and to trust the company’s services and processes. Image taken from Deo's facebook page. The most amazing thing is that we are willing to expose ourselves for free!!!!! We share our thoughts and desires with all of Facebook’s vendors and essentially give them permission to exploit us. And how much they can exploit us increases with every new detail about ourselves that we share. What’s more, vendors do not care about your rationality or what is right for you. They only care about engaging you—at the most personal level they can—so they can push their products and/or services. I forgot to mention one thing: Before the vendors even get there, Facebook intervenes and tells vendors that they can help them categorize prospects by different types of behaviors. These behaviors, in turn, align with different user interests. So vendors can increase the likelihood that their messages will target the most likely prospects. In short, by the time vendors get into your brain, Facebook has already created a map of the emotional areas they appeal to maximize the effectiveness of their pitch. And the reason it all works so well is that it comes full circle: right back to the users. Facebook does not pressure the users to give them all of their data. They don’t have to. And by taking this low-key, backdoor approach, they make you believe that Facebook is a safe place to share your desires, interests, fears and obsessions. But it’s not, because Facebook collects all this information, configures it to create user profiles and then uses it to enhance the user experience and, more importantly, to provide a structure for vendors to best leverage. Facebook tactics are not new. But they’re certainly easier to implement and maintain when you have 2 billion users who can’t wait to share their data for free—every day! Clearly, Facebook’s core operations are data collection and data analytics. Their ability to analyze user data and group it into different categories based on patterns of user behavior provides them with everything their business model needs to attract advertisers. Political strategists love Facebook because everything they need is right at their fingertips. They use the same tactics and strategies vendors use to get information and to tailor their messages to hit the emotional hot buttons, which will result in favorable public opinion and, ultimately, votes for their side. Cambridge Analytica used the same methods many businesses use to influence customers and drive sales. Cambridge Analytica is probably not the first or the only political strategy firm to use these tactics. Nor are they the first or only such firm to have a loose relationship with the truth. But even so, the biggest spotlight should be on Facebook. Image taken from Youtube on the Guardian news live stream of the hearing. What frustrated me about the Washington hearing is that Congress did not challenge Zuckerberg about his revenue stream methods, or his analysis and influence tactics regarding user data. The issue is not about Facebook selling our data. It’s about Facebook not informing users how their data is being used internally and about how outside vendors are using the data to influence prospects. Facebook also needs to explain to users the data link model, indirect access to data from friends and connections. Some external developers, who can’t access data of users who are not subscribing to Facebook services, are able to get it through the friends. It is hard for me to believe that our senators and representatives were not properly briefed by their staffs, assuming they were briefed at all, about the operational structure of Facebook. 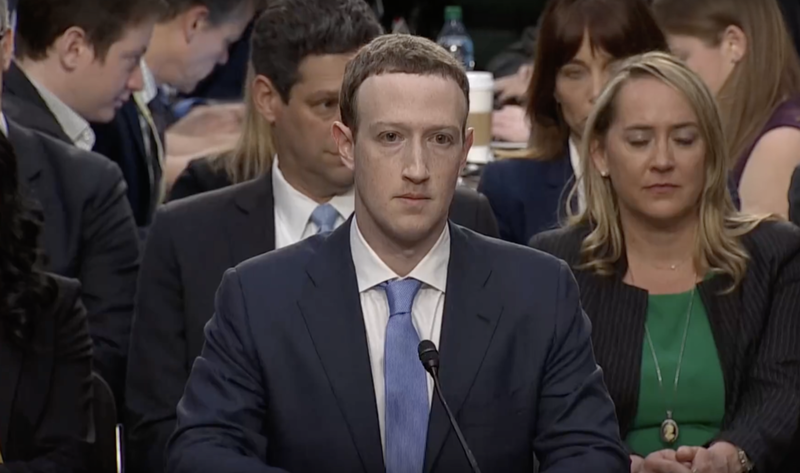 However, being so unprepared, they were incapable of drilling Zuckerberg with truly probing questions about the vulnerability and exploitation of users’ data. And so it seems clear that any meaningful change—at least for the immediate future—will not come from Facebook or the government. It will come from users. Users need to educate themselves about how their data is being used to manipulate them and develop parameters to protect themselves. They need to be vigilant about protecting their rights and privacy. They need to exercise caution when sharing ideas, interests, emotions, wants and needs. The only way to beat the Facebook algorithm is by understanding how it works and then to leverage it for your benefit, not for someone else’s. Be careful about what you share. And whatever you do share, learn how it can be used to influence or manipulate you. As for those of us who lack the willpower to control what we share and the curiosity to become informed about data usage, ask yourself this: Is it still worth it to be on Facebook? Newer PostFaith: How my mother’s faith in God helped my family escape genocide in the Congo.